Fatima is a small town north of Lisbon with a population of fewer than 8000 people. Once a sleepy backwater in Portugal that depended upon the production of olive oil, today Fatima derives the bulk of its wealth from religious tourism and pilgrimage. Unlike most pilgrimage destinations, Fatima's holy claims derive not from Medieval events (pilgrimage was very popular in the 11th and 12th centuries), but rather from 20th-century apparitions. On the 13th of May in 1917, the Virgin Mary is said to have appeared in a flash of light to three shepherd children near Fatima in a field called the Cova de Iria, exhorting them to return to the same spot on the 13th of each month. Calling herself The Lady of the Rosary, in October she revealed the three "Secrets of Fatima," relating to peace and world events, to one of the children. Fatima is most popular on the May anniversary, but smaller pilgrimages are held on the 12th and 13th of every month. The 100th anniversary of the apparition falls in 2017. Religious tourism centers around the Sanctuary of Our Lady of the Rosary of Fatima, an extraordinary complex for a small town. The Basilica of Our Lady of Fatima, a national shrine, is built in a neoclassical style with a tall central tower. Construction began on May 13th, 1928. The tombs of Lucia (currently in the process of beatification as she passed away recently), Saint Jacinta, and Saint Francisco are inside the Basilica, which is free to visit. Walk and see the Hungarian Stations of the Cross consist of 14 chapels built along a three-kilometer stone walkway leading uphill to a marble monument of Christ on the cross. Visit the Homes of the Children, which has largely been unchanged in 80 years and offers a good chance to see what life was like in those times in Portugal. It can be visited in Aljustrel, just over three kilometers from Fatima. Perhaps the best way to see what you want to see in Fatima is to take a private tour as is offered by Viator. 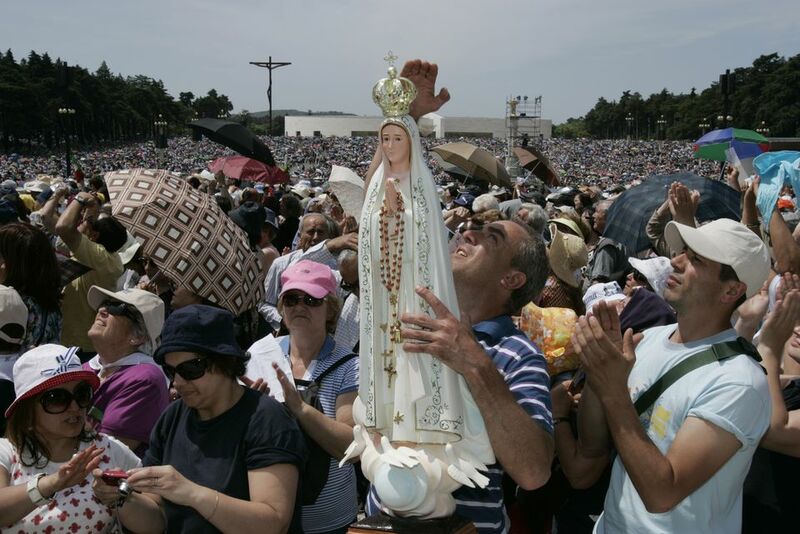 High season for a pilgrimage to Fatima is, as you might expect, from May to October. You can bus or train to Fatima from Lisbon or Porto. Be aware that there is no train station in Fatima itself, but shuttle buses connect the Caxarias station to Fatima (or you can take a taxi). The train/shuttle bus route will take a little over two hours. Rede Express buses run from Lisbon's Sete Rios station. The trip takes about 90 minutes. By car, Fatima can be accessed from the A1 motorway. Exit at Fatima and follow signs to the Santuario. While many pilgrims camp out in the countryside, there are quite a few hotels and guest houses available in Fatima. Remember to reserve well in advance if you plan your vacation during the celebration periods or the high period, May-October.